Sewing the Orla top? 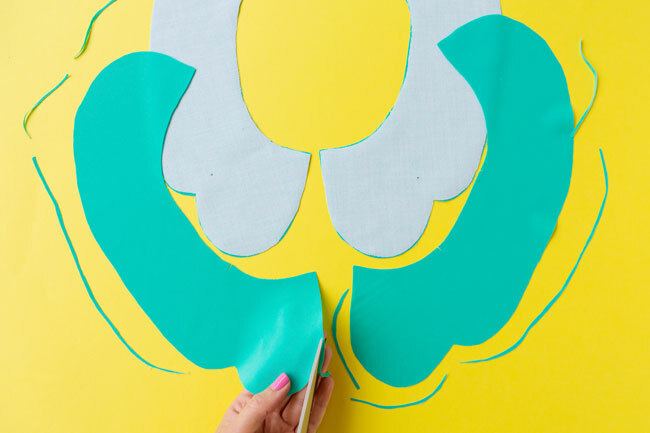 Today I’m going to take you through sewing the snowdrop collar (yes, I totally made that term up). Still here? Let’s get to it! So you should have cut out four collar pieces and interfaced two symmetrical pieces (read the post on cutting and stabilising your fabric if you don’t know what I’m talking about). The two interfaced collar pieces will form the “top collar”, the other two will be the “under collar”. A little extra note on interfacing the collar – if your fabric is very fine, you might find you get a neater collar by trimming the seam allowance off the interfacing before applying it, so it’s easier to press under later. It’s a bit fiddly to cut and stick accurately though, and not essential, so don’t worry too much about this. Just an option to bear in mind if you’re struggling to press the collar into a neat curve later. Trim the outer edge of each of the two under collar pieces down by 2mm (just under 1/8in), tapering to 0mm at the corners. Making the under collars a teeny bit smaller than the top collars will help the seam lines roll to the underside so you don’t see them when you’re wearing the top. Starting with the corners and the notches, pin each top collar piece to its matching under collar piece at the outer edges, right sides together. Keep the pins at right angles to the raw edge of the fabric. Since you trimmed the under collars, you’ll need to stretch them ever so slightly to fit the top collars – make sure the notches match up so the collar is stretched evenly. 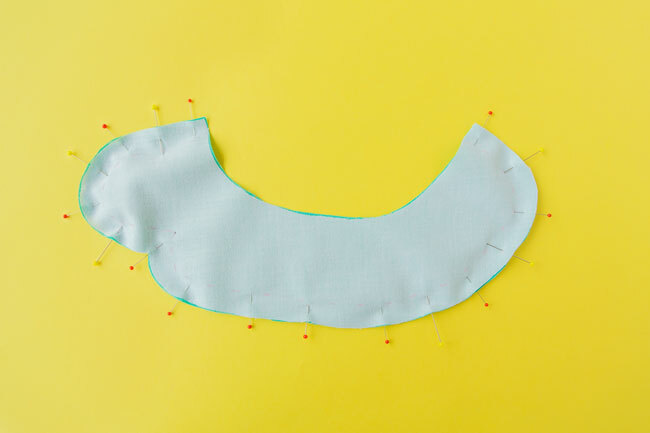 With the interfaced piece face up, sew each pair of collar pieces together around the outer edge, pivoting at the point marked on the pattern. Shortening the stitch length a little (to 1.5-2mm) will help you navigate the curves, but take care to keep the small stitches smooth (if you use too small a stitch length, they may go a bit wibbly). Sewing with the interfacing on top will help feed the two layers through the machine evenly, without distortion. Leave the neckline unstitched. The inner corner around the pivot point can come under a bit of strain when it’s turned out, so go over the stitches around this point to reinforce them. Trim the seam allowances down to about 5mm (1/4in). 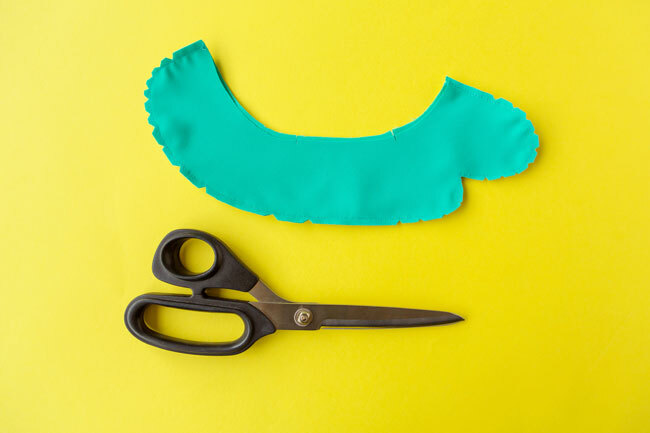 Cut triangular notches into the seam allowances around the outer edges of the curves and at the inner corner, taking care not to cut through the stitching line. Trimming and notching will help reduce the bulk of the seam allowances when the collar is turned right sides out. Now we need to do lots of pressing to get nice smooth curves. 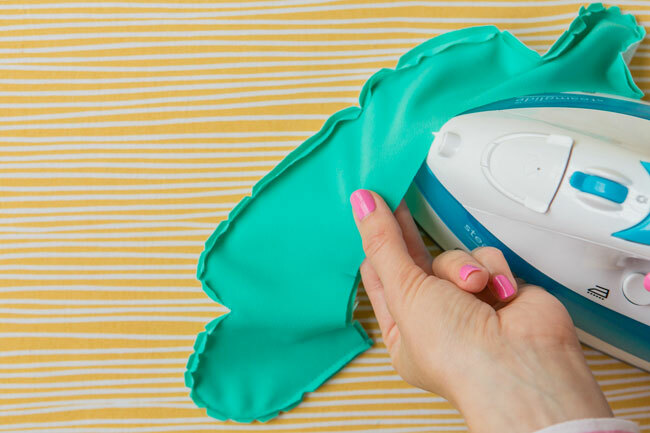 Use as much heat as your fabric can take without scorching – test the iron setting out on a scrap first. Steam will really help shape the curves, however be careful about getting steam on the interfaced side as it might get squidged up into a sticky mess! We’re going to start by neatening up the seam line to get it nice and defined. Starting with the collar still turned wrong sides out, press the seam allowances apart – the way I do this is to press the uppermost seam allowance back against the collar, then turn the collar over and do the same on the other side. Next, neaten it from the right side, by running the tip of the iron along the seam line between the layers. Turn the collar pieces right sides out, and run the iron along the seam line again, this time on the inside. 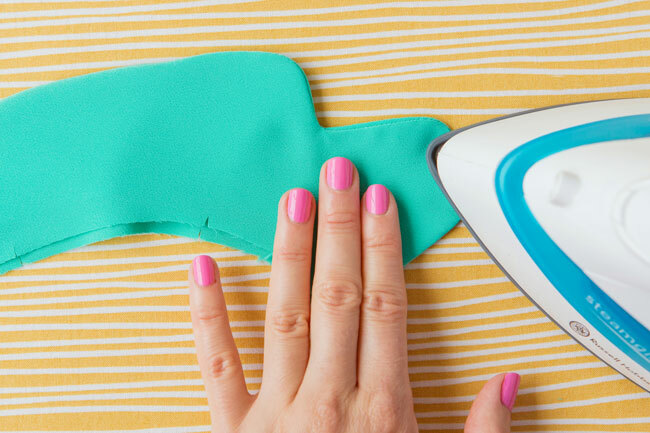 The iron won’t fit into the smaller curves – you could run a blunt butter knife or similar implement (love that word) along the seam line to neaten it up. 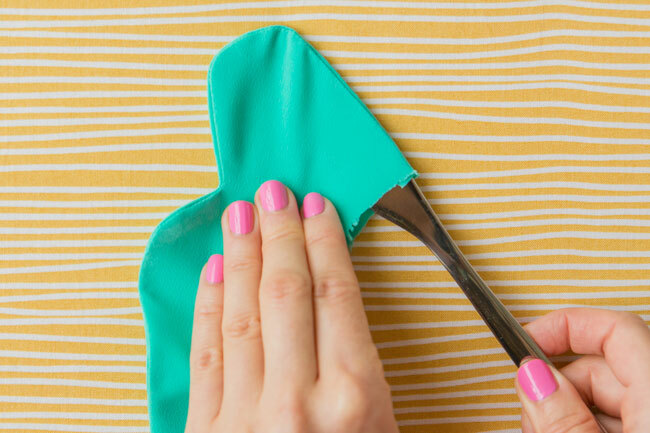 Just be careful not to touch the iron to the knife, for obvious reasons! Finally, press the collar flat, rolling the seam line slightly towards the under collar so you won’t see it from the top collar side. Now to attach the collar to the bodice. Lay the bodice out flat, right sides up. Lay the collar pieces over the neckline, the under collar against the right side of the bodice. 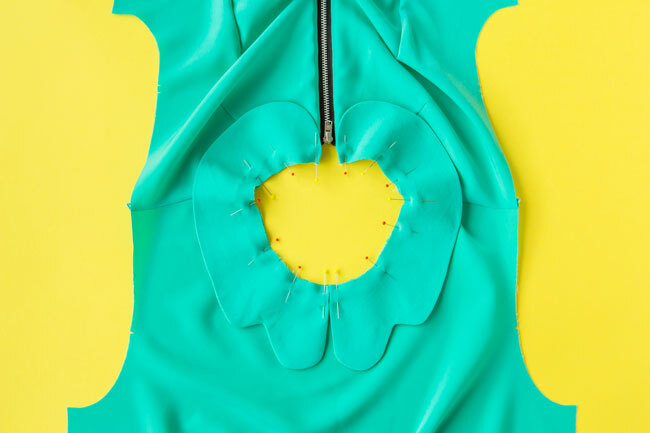 Pin them together at the neckline – start by pinning the front of the collar pieces so they meet flush at the centre front notch that you trimmed on the neckline earlier; then align the back edges with the edges of the fabric at the zip opening; next match up the shoulder notches with the shoulder seams and the front neckline notches with the notches on the neckline. Once these bits are all pinned, you can pin the rest of the collar to the neckline. Since you stay stitched the neckline earlier, hopefully the collar will fit the neckline fairly easily. However, it’s not uncommon to find that the collar looks a little smaller than the neckline, either because it’s been cut a bit small, sewn a bit small, because the interfacing has made it less flexible than the neckline, or a combination of the above. 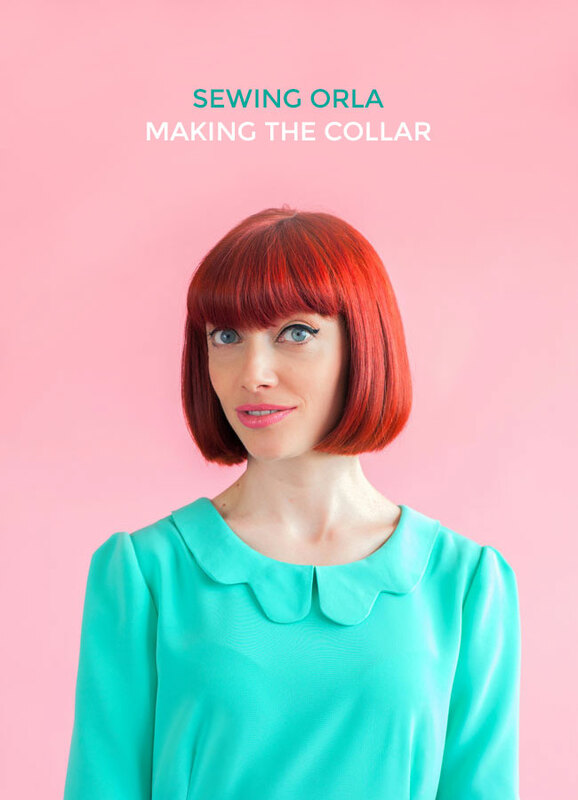 Just stretch the collar gently and evenly until it matches the neckline. 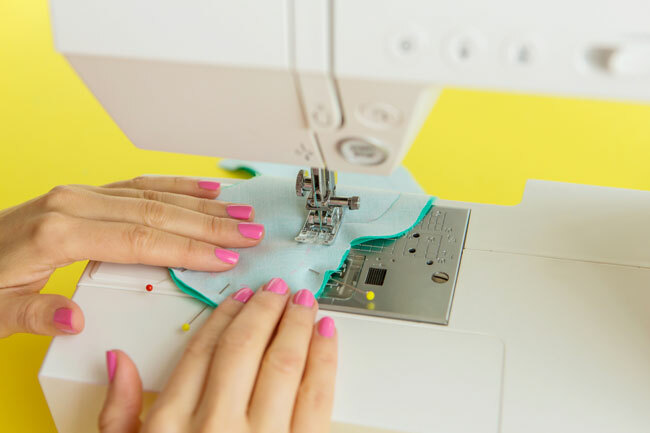 Set your machine to a longer stitch length (4mm) and tack (baste) the collar to the neckline with a 10mm (3/8in) seam allowance. Take extra care when you come to the centre front where the two collar pieces meet – hold them flush together when you sew over them so you don’t end up with a gap between them. In fact, you could tack this bit first if you want to make extra sure you get it looking nice. How are you getting on with your Orla top?